Move over JLo! We’ve got a new diva in town! Brazilian singer Cláudia Leitte has proved that she definitely needs to get out of Brazil and grace us with her looks, her amazing body and her enviable moves. 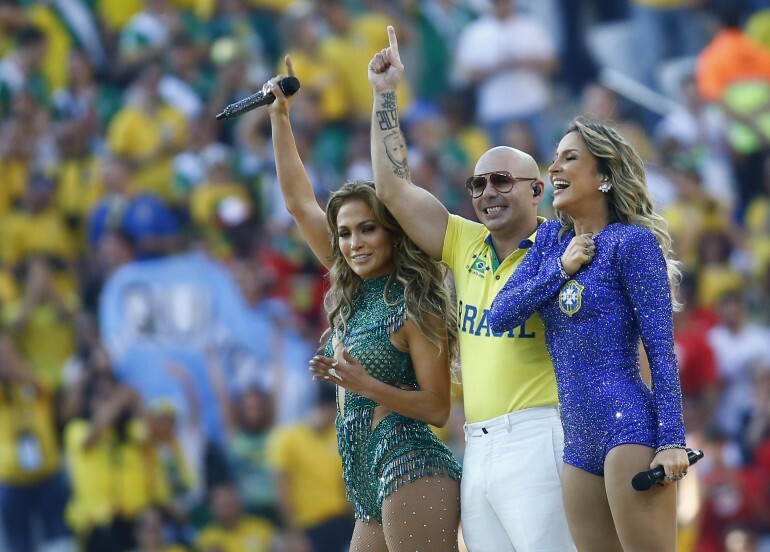 Leitte was the counterpart for Jennifer Lopez and Pitbull in the official song for the FIFA World Cup 2014, "We Are One (Ole Ola)." Now that we’ve finally seen her in all her glory, we can’t help but to wonder, who exactly is Cláudia Leitte and why is she so big in her country? 1) Turns out, Cláudia Leitte has always had the music in her. She started singing when she was only three, and by age 7, she joined a kids group. By the time she was 13, Claudia was already a professional singer. 2) As an adult, Cláudia began singing in bars and carnivals, and tried her luck with different groups until she finally hit the jackpot with Babado Novo (or maybe they hit the jackpot with her!). She joined the Salvador-based axé band in November 2001, and released five albums with them. 3) The band's first album, named “Sem Vergonha,” was released in 2003 and sold more than 90,000 copies, being the band's first Gold record. “Uau! Babado Novo ao Vivo em Salvador,” released in 2004, sold more than 100,000 CDs and more than 70,000 DVDs, and released in December 2005, “Diário de Claudinha” sold 70,000 copies in just one week. 4) Leitte was nominated for the 2007 MTV Video Music Awards Brazil, and in the same year, she won Brazil’s Best Female Singer award, handed to her by GloboRadio. She beat some of the best Brazilian vocalists Ivete Sangalo, Sandy, Ana Carolina and Maria Rita. 5) In 2008, Claudinha, as people call her, announced that she would be leaving Babado Novo and start her solo career. 6) Besides being a singer, she was the face of AmBev’s Guaraná Antarctica for three years from 2008-2011. 7) Cláudia performed at Miss Universe 2011, held in Sao Paolo, during the swimsuit competition. She sang her single “Locomotion Batucada.” That same year, she performed at Rock in Rio, and recorded “Samba,” a song and music video with Ricky Martin. 8) She’s currently a coach on The Voice Brazil. 9) Claudinha has been married to her high school sweetheart Marcio Quarry for seven years. He’s an entrepreneur. They have two kids together. 10) She is considered, along with Ivete Sangalo, the most powerful Brazilian artists. 11) Not only does she sing beautifully, but Cláudia’s also got some killer moves. Just check out the video below in which she does a Zumba choreography, and scroll through the pics above to see more of this Brazilian beauty!